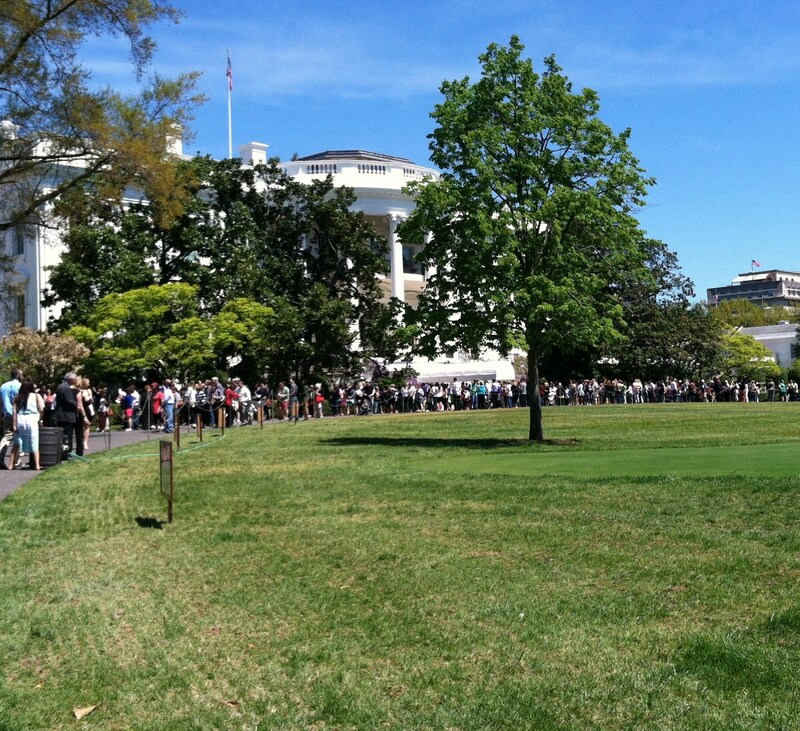 My ticket for the 2014 White House Spring Garden Tour was for noon but I got in line at 11:40 a.m. and there were yards of people ahead of me. It took about an hour to actually gain entrance but it was such a beautiful day, I did not mind. Visitors were from different countries; I could hear different languages. People were dressed in Sunday best or Saturday jeans, which surprised me because I thought of it as a walking tour so I wore tennis shoes. I know the White House Garden Tour, as is the White House itself, is a tourist attraction but I thought it was great that the natural beauty of the gardens is what brought different folks together. Gardens can be a common denominator, talking about gardening identifies commonalities and builds relationships. After getting through the security check point, we entered the South Lawn area and proceeded toward the back of the White House. We received a souvenir brochure with a message from Michelle Obama, courtesy of the White House Historical Association. People immediately began to take photos of their families against the backdrop of the White House (ah!, that is why they are dressed up!) Along the perimeter of the lawn and gardens were photos of past First Families, either planting a tree or with their families in the garden. 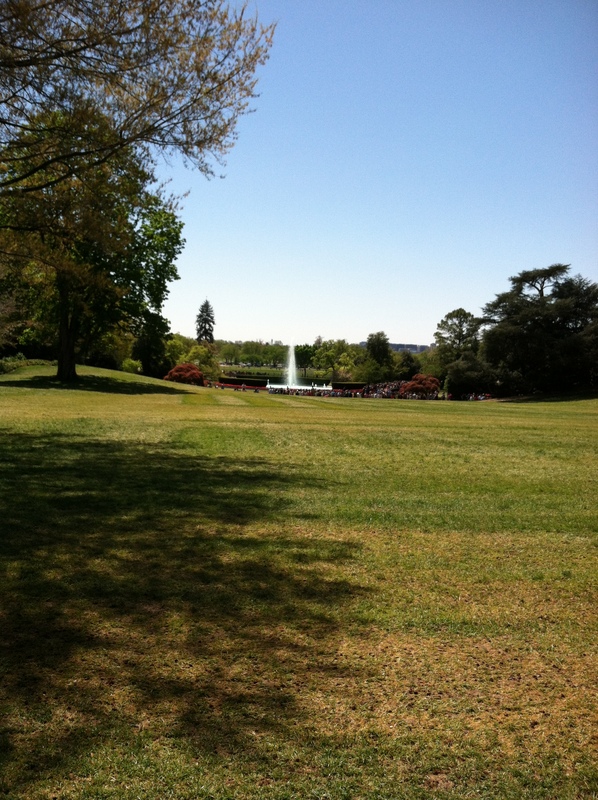 I took several shots of the view away from the White House, towards the Ellipse, with a fountain in the middle. 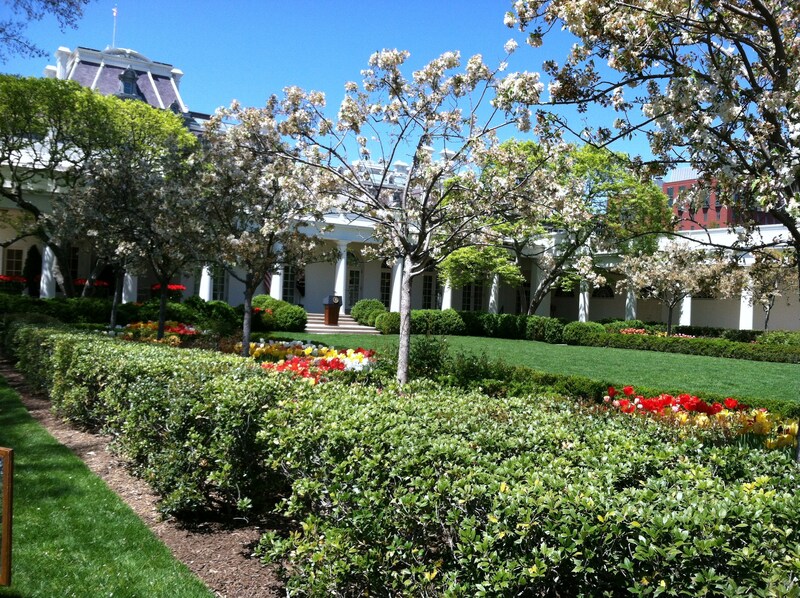 The South Lawn is very green and has a very cooling atmosphere. It is surprisingly large but feels enclosed, private, and quiet. The large trees contribute to the peace and the awe – they capture the sense of time and history. Since the 1870s, most Presidents have planted a tree while in office and according to the brochure the oldest surviving trees are the two Southern Magnolias planted by Andrew Jackson in 1830. I walked past the formal Jacqueline Kennedy Garden and the Rose Garden, which had a podium similar to the one the President uses. I took a few shots of the Rose Garden, the putting green, and the playground. We were not allowed to view the Children’s Garden which was created by Lady Bird Johnson but I could see a glimpse of the tennis courts through the trees. The crowds were directed toward the Kitchen Garden, which is actually quite a distance from the White House. 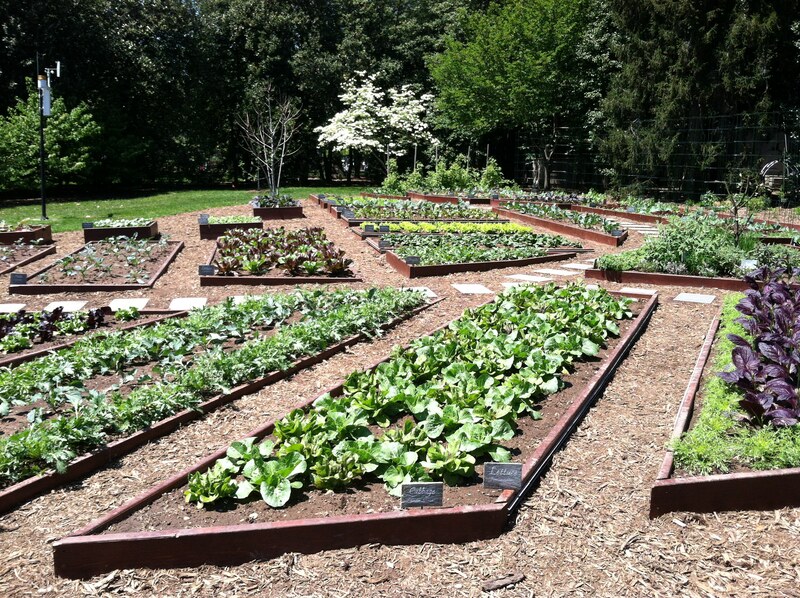 First created in 2009, the White House Kitchen Garden has over 30 raised beds of vegetables and herbs, including one bed devoted to plants raised from seeds of Thomas Jefferson’s plants from the Monticello gardens. 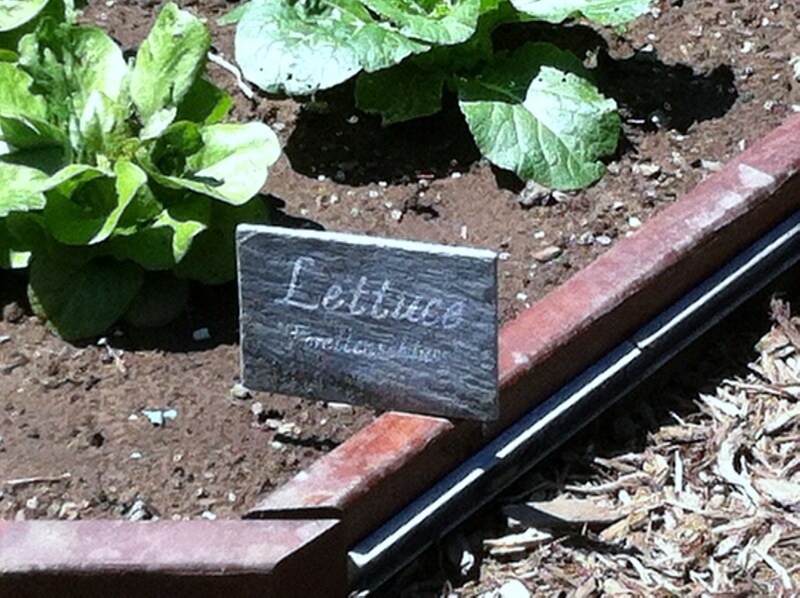 I could see lettuce, cauliflower, mizuma, garlic, kale, mustard, carrots, peas, and arugula. 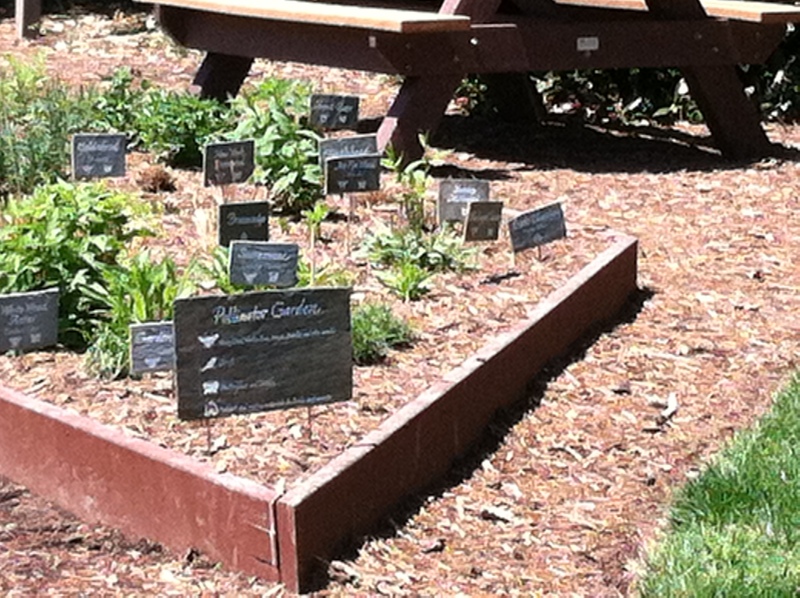 Only a few weeks ago, Michelle Obama invited school kids to help with the sixth annual planting of the Kitchen Garden, and this time they planted the first White House Pollinator Garden. These beds will have flowering non edible plants to encourage pollinators such as bees and butterflies. Because the plants were just planted they were a little too small to see but the signage was lovely. In fact, all the vegetables and herbs were identified with the same type of signage and all the rows were clean and weed free. Behind me a lady said the vegetables were so beautiful and large, they were ready to be harvested but staff were probably waiting until the Spring Garden Tour was over in order to cut the leaves. I am sure someone is going to enjoy fresh produce next week! 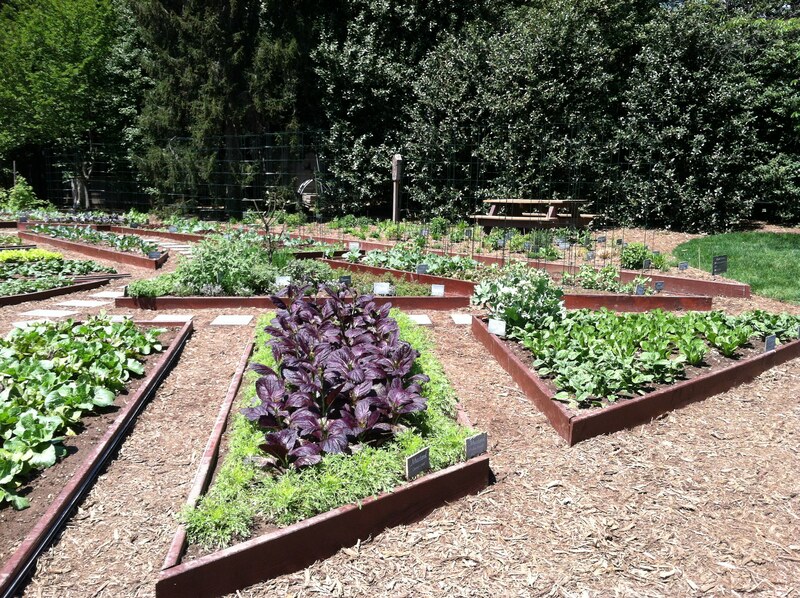 This entry was posted in Uncategorized and tagged Kitchen Garden, White House, White House Kitchen Garden, white house spring garden tour. Bookmark the permalink.